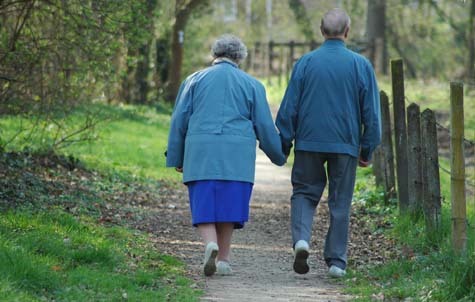 Alzheimer's in the elderly marks a significant challenge for family members. One afternoon in the Spring of 2007, Franklin Sommer forgot who his wife was. Since his diagnosis with Alzheimer’s disease in 2004, Sommer had been living with his wife, Louise Sommer, but now his condition had deteriorated. His behavior became erratic and combative, and Mary Irwin feared that her father might hurt himself or her mother. Though Louise didn’t want to let him go, she was no longer equipped to care for him on her own. So Mary Irwin moved her father to an Alzheimer’s facility in their hometown of Louisville, Kentucky, and later, when he was close to death, to a hospice. “I was on an emotional roller coaster the entire time,” she says. Mary Irwin’s experience with Alzheimer’s is all too common: a family member forced to make wrenching decisions about how a loved one suffering from the disease will live, and ultimately how he or she will die. If doctors were able to diagnose earlier or, even better, halt or reverse the spread of dementia with effective drugs, it could give patients and families more time to cope with the disease and make end-of-life decisions together. Unfortunately, such diagnostic tools and medications are only now being developed. Alzheimer’s is typically diagnosed in the later stages of the disease once a patient has more serious cognitive impairment. At the onset, usually in a person’s late 60s or 70s, sufferers forget small things—like where they placed the house keys. But as Alzheimer’s progresses, they forget more important things—like where they live and who their children are. Eventually they lose physical abilities as well—the capacity to speak, walk or swallow. Disease diagnosis is tricky because neurologists can only assess patients by watching their progressive memory loss. A definitive diagnosis of Alzheimer’s comes only at autopsy when the naked brain can be examined for signs of physical changes. There are innovative treatments in the works, however, which may not only help those who suffer from Alzheimer’s, but also their family members who endure the disease along with them. “If the onset or the progression of the disease can be delayed with multiple treatments, patients would have more time to make appropriate plans so family members may not have to,” says Michael Wolfe, a neurologist at Harvard University who researches Alzheimer’s. In fact, as Alzheimer’s gets worse, family members spend more time each day caring for a loved one, sometimes up to 14 hours, researchers recently reported in the International Journal of Geriatric Psychiatry. In another study in the same journal, researchers found that a caregiver’s quality of life was closely linked to the severity of Alzheimer’s. Time and energy spent caring for and making decisions for Alzheimer’s sufferers place families in a strained position. Families struggle between wanting to do everything in their power to help their loved one and knowing that this person has no hope for improving. Alzheimer’s currently afflicts five million Americans and 24 million people worldwide, yet no one knows what triggers the disease or the best way to treat it. People with the condition inevitably lose the ability to perform the basic functions that make us human: the capacity to think, to speak and to remember. Ellie Wirzburger’s story showcases one of the crucial dilemmas that family members face during the earlier stages of the disease: denial. Families often don’t want to admit that dementia has consumed their loved ones and that they are not equipped to care for them anymore. This conflict heaps emotional stress on the family. The source of this guilt, according to Rabins of Johns Hopkins, is the need for families to make decisions for a loved one who previously made independent decisions. “If this is true, then improved cognition might lessen the negative impact on family members,” he says.